The Ultimate Floral Gift - Flowers For A Year – La Belle Fleur Floral Boutique Ltd.
featuring Signature Designs by La Belle Fleur Floral Boutique Ltd.
La Belle Fleur Floral Boutique’s Signature Designs are made with the freshest and the most beautiful flowers and foliage available - hand selected by our professional designers. Our expert designers will use their innovative talents to create inspired floral art in the form of a gorgeous floral arrangement ideal for your home or for both personal and corporate gift-giving. Our designers will take into consideration the personal tastes of the recipient when making their flower and colour selections. As well, if the recipient has any preferences or allergies please let us know in advance and we will accommodate their desires. 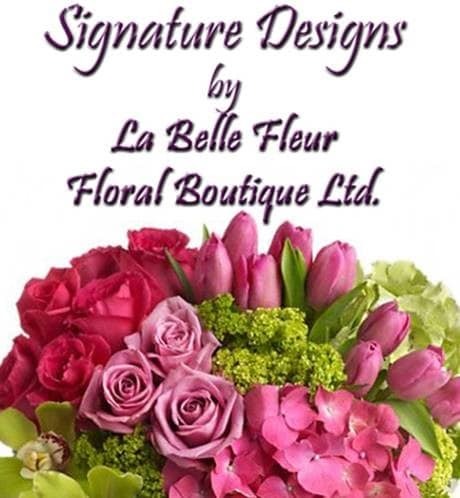 Our commitment to servicing our clientele's needs, with the exceptional service we demand of ourselves, as professional florists, make La Belle Fleur Floral Boutique Ltd., the florist of choice for Surrey, White Rock and Delta BC. We would be honoured to be your floral service provider. Make someone's year! Let us create a new floral gift each month! You can customize your gift or let us create each gift on your behalf. Whatever your budget, all flowers we use are of the highest quality ALWAYS. We will call you for details when order received. Order can be processed monthly or one-time fee.